In the summer of 2012 the Cockapoo Owners Club decided that it would be nice to do some charity fundraising and we choose to support Hearing Dogs for Deaf People . The Clubs first fundraising event was selling our black and white logo as a car sticker. Followed by handmade bandanas for the dogs, bow ties for the dogs, a guess the money in the jar competition, an online dog show, a Bingo Night and had our first Cockapoo Owners Club calendar . Since we started fund raising we have raised over £11k including Gift Aid, for Hearing Dogs For Deaf People. Donations can be made on the following link, using either PayPal, Debit or Credit card. If you are a UK taxpayer please remember to click the Gift Aid box. Or you can pay via your mobile phone : You can also text £1, £2, £3 £5 or £10 donations enter COUK48 and amount and send to 70070. 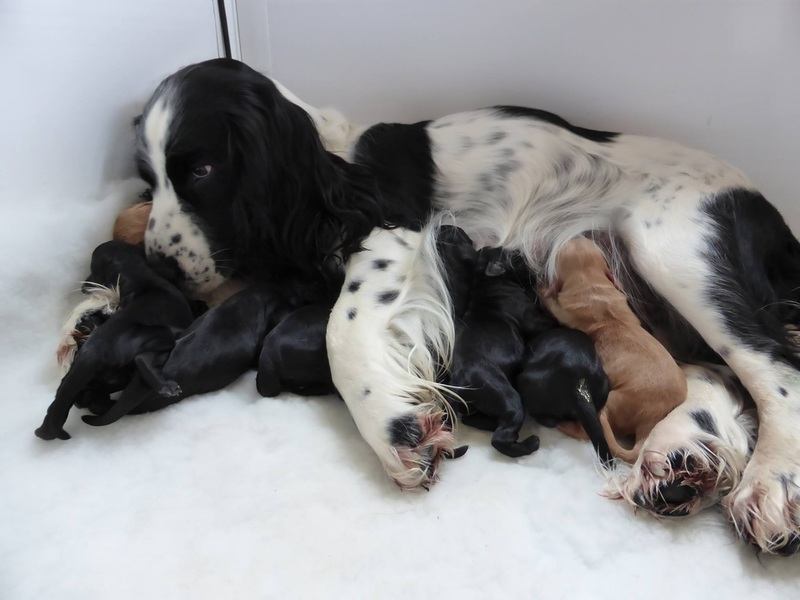 Ginny with her litter of cockapoo puppies including Harvey. We have continued with a variety of fund raising events which can be found here : ﻿Fund Raising 2014/2015 . From Oct 2014 we have expanded our fund raising by raising funds for Cancer Research UK and have already raised over £3k including Gift aid.